The largest building block of sustainable design, the focus on energy efficiency has created a paradigm shift in how healthcare buildings are designed, built, and operated. Today’s innovative approaches to sustainable hospital design are based on the unique characteristics of the healthcare business. Hospitals must be open every hour of every day of every year. Moreover, the hospital’s main client base — ill and sometimes dying patients — makes healthcare structures significantly different from other types of buildings. Innovations in hospital design are taking place on four fronts: energy efficiency, building envelope design, interior design, and health and wellness. In each case, sustainable strategies are being used to achieve another important goal: improving patient satisfaction. Energy efficiency is the largest building block of sustainable design. But in healthcare there has been a paradigm shift, explains Dominic Spadafore, senior project manager and corporate sustainability program leader for Dewberry. “In modern healthcare, we are encouraging patient participation and empowerment,” he says, which means that the hospital wants patients and staff to have more control over their environment. But this does not mean hospitals aren’t going the last mile to wring every last drop of energy efficiency out of their systems. Orion Morrissey, principal and mechanical engineer for Stantec, says that heat recovery chillers are “a great application for hospitals,” because they capture waste heat from HVAC systems and are much more efficient than traditional steam boiler plants, which are resilient but not energy efficient. On the West Coast, where earthquakes or fires may shut down natural gas lines, dual-fuel steam boilers provide resiliency to ensure that the hospital stays operational after a crisis or natural disaster. The application of heat recovery chillers — in addition to dual-fuel steam boiler plants — provides both energy efficiency and resilience. In milder climates on the West Coast, hospital buildings can make use of “100 percent outside (air) systems instead of recirculating air systems without much additional energy consumption while increasing indoor air quality for patients,” says Morrissey. 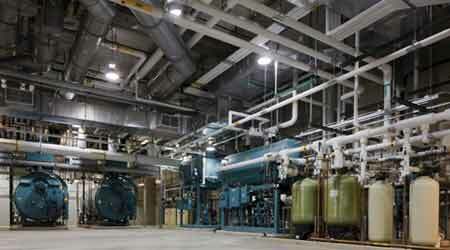 “The state of Washington is the leader in code-mandated, energy-efficient requirements for hospitals,” Morrissey says. An advanced energy strategy being seen throughout the real estate industry but which especially impacts hospitals is the use of energy analytics to run buildings, says Kyle Hendricks, Sr., energy and sustainability manager for CBRE Global Workplace Solutions. These analytics platforms “use real time data generated by systems mostly on the building side of the hospital,” Hendricks says. For example, data about HVAC systems, lighting, and so forth allows the hospital to make proactive decisions and catch problems (for example, comfort issues) before they become complaints. The high energy intensity of a hospital increases the potential energy savings available from analytics. Hendricks says that “occupancy-based and use-based energy management is a huge benefit of analytics and smart-building technologies.” For example, some operating suites are not needed to be online at all times, and analytics can help to manage those spaces efficiently and turn them on and off quickly while minimizing energy use. The difference between typical building management systems that control equipment and building analytics is that analytics look at trends over time and “can tell you if you are out of compliance with respect to your assets’ operational performance metrics and give you notice of failure,” says Dennis Witte, director, energy and sustainability, CBRE. By looking at a variety of metrics, facility managers can try to enhance employee health and well-being and not just achieve energy savings.